Biglietti Dreaming '69 - Back to Woodstock - B.E. Home / Ricerca eventi / Dreaming '69 - Back to Woodstock - B.E. Dopo il grande successo di Dreaming ’69 2018, quest’anno SMP Eventi amplia ulteriormente il bacino di generi musicali, attività ed artisti coinvolti in modo da fornire servizi ed intrattenimento sempre più coinvolgenti. E’ proprio il coinvolgimento e lo spirito di condivisione che spingono il nostro staff a pensare sempre nuovi modi per integrare nuove realtà, come ad esempio i ragazzi diversamente abili ai quali abbiamo riservato una serie di attività totalmente gratuite: Tiro con l’arco, basket, rugby, pittura..ecc. Attività tutte fruibili anche da bambini ed adulti che potranno condividere momenti di divertimento, relax, e spensieratezza. I Bambini in particolare verranno seguiti l’intera giornata da uno staff di animatori qualificati che li guideranno durante tutte le attività pensate appositamente per loro. La parte musicale sarà suddivisa in 4 Aree indipendenti: Area Rock Area Reggae/Dub Area Rap/Hip Hop Area House. L’intrattenimento musicale live è affidato ai Miracle - Italian Queen Tribute Band, Back In Hell - AC/DC Tribute e Frijda che si alterneranno sul palco con i tanti dj ospiti e resident: Gianluca Montagna, Francolino, Fabio La Manna, i ragazzi di Nasty Juice, di Culture Keeper Hi-Fi, Nuccio Giuffrida, DJ SEBY, Nunzio Ciuridda, sono solo alcuni degli artisti che selezioneranno musica durante la manifestazione. L’area Food & Drink sarà curata dall’esperiente staff del Lido Jolly che offrirà un’ampia scelta di antipasti tipici, vino, birra e il classico barbeque del 25 Aprile. Le seguenti attività sono state organizzate in modo da intrattenere tutti per l’intera giornata e sono totalmente #GRATUITE: Dimostrazioni e approccio al surf con Surf School Catania Allenamento con partitella e filosofia sportiva tipici del Rugby e del Basket Dimostrazione artistica di Writers Esposizione di Moto Esibizione sportiva di Pound Spettacolo Musical/Teatrale Suburbia Tiro con l’arco Tanti saranno anche gli stand che comporranno il nostro mercatino: hemp shop, t-shirt, gadget, area Tattoo, vintage shop, ecc..
Prevendita € 13 L’ingresso è totalmente gratuito per i bambini al di sotto dei 12 anni e per i disabili con relativo accompagnatore. Purchase - Dreaming '69 - Back to Woodstock - B.E. The applied price will be shown just after seats selection. Please read carefully what is reported below, referring to the purchase transactions made through this portal. 1. General Conditions of online Sale These General Terms and Conditions regulate the sale of tickets (defined below) to customers, for entertainment, cultural or sports events (as well as any products and / or combined services to events) effected through the portal www.liveticket.it on behalf of various Organizers (defined below). Liveticket is the trademark of the automated ticketing system developed, marketed and managed by GOSTEC snc, with registered office at Via XXVII August 27, 61032 Fano (PU) - Italy, hereinafter referred LIVETICKET, through this portal every customer has the opportunity, after appropriate registration, to make purchases related to events on the website itself. 2. Organizers The organizers are the individuals responsible for the organization of events. The organizer therefore also decide every aspect of the sale of tickets. Liveticket accords with the organizer the methods of pre-sales management, and manage money collections on behalf organizer. 3. Tickets and Events 3.1 Ticket buyers on www.liveticket.it, must purchase tickets to access the event location and see the event. Apply to them the rules applicable to the customer. 3.2 The ticket can not be transferred for money or may be subject to brokerage. 3.3 Liveticket has the right to cancel a ticket and a purchase order executed at any time, for technical or organizational reasons. In particular, any purchase transaction made, if payment has not been processed within the specified time, it will be automatically canceled by Liveticket. In case of cancellation of tickets with a executed payment, Liveticket or event organizer will provide to refund the amount. If the customer has received the tickets, refund can be made only after the return of the tickets to the terms indicated. 4. Payments Payment method used by the customer are determined by Liveticket possibly in agreement with the organizer, who may apply restrictions and exclusions to payment method used by the Customer, for security reasons or otherwise. Payment by credit card is managed through Cartasi and/or Unicredit, a leading Italian company in the field of banking and e-commerce. The transactions are absolutely secure and take advantage of high security protocols. Credit card supported are: VISA, MASTERCARD, VISA ELECTRON and POSTEPAY. The authorization for the transaction by credit card is immediate and occurs simultaneously with the order confirmation, the actual transaction can take place, however, with a few days late. The data of the credit cards of customers will not be in any way managed or saved by GOSTEC-LIVETICKET nor by others outside of CARTASI and/or Unicredit. For payments by bank transfer, PostePay or Paypal, Liveticket will be responsible to provide the Customer, once received the transaction request, the IBAN or the bank code on which to make the payment. This payment must be necessarily made within the indicated terms. If the payment with PayPal is active, it may be automatically proposed or it may be necessary to connect with owned account and execute payment towards the mailbox provided in the transaction confirmation that Liveticket will send at the end of online purchase. Such payment must necessarily be made within the specified time limit. 5. Ticket prices and additional fees The ticket price is reported on the same ticket as decided by the organizer. Under the agreements with organizers, the presale fee due to Liveticket can be included in the ticket or not, in this second case Liveticket will apply on each transaction of sale an additional service fee, as its revenue, integration of its revenue (if the organizer refund only part of the price) or for the service rendered. The additional fees, if any, may vary with the method of payment, based on costs of the various payment services themselves. Any such increases are explicitly highlighted in special sections during the process of purchase. In case you request a particular type of delivery of tickets, for example, the shipment at the customer, Liveticket reserves to apply specific service fees as a contribution to the shipment. 6. Communication of confirmation of the transaction. For each transaction successfully completed, will be sent via email, communicated by the customer during the registration, a notice confirming the transaction. Any communication contains summary data of the event, the purchased tickets, payment methods and delivery, data of the customer and an order code unique for each transaction, which identifies the transaction same. It’s necessary to keep a copy of the confirmation email. In case the purchase is related to digital tickets, the email will contain qr-codes; the customers must show them at the box office to get access to the event. 7. Waiver online purchase If the customer decides they want to give up the previously purchased ticket, there is no refund, will not be refunded the price of the ticket and not even any additional fees. It’s not possible, in fact, exercise the right of withdrawal pursuant to Article 55 of the Consumer Code and pursuant to the Decree of 22 May 1999, n. 185, as reported in the art. 7 paragraph B. In some cases, however, the organizer may nevertheless decide to refund the tickets on request for valid reasons. 8. Event postponed or canceled 8.1 Liveticket is in no way responsible for any inconvenience caused by changes in the programming of an Event. If these occur, the customer who purchased the ticket will have no right to obtain the replacement of the ticket or to be refunded, if not according to the Organizer dispositions, who is the entity responsible of any changes. 8.2 Liveticket is in no way responsible for any cancellations of events. If this happen, the Customer may request a refund of the ticket purchased relative to that specific event except for the presale fee and other costs charged for the execution of the service (payment and delivery fee). Liveticket will refund only in the case of delegation of the Organizer himself, in the manner and time determined by him. Tickets for these events can not be swapped with tickets related to other events. 8.3 In any case, Liveticket will not replace the ticket in case it is lost, damaged, destroyed, damaged, stolen, or become entirely or partially illegible. 9. Delivery methods The customer has, in some cases, the choice of shipment by e-mail, shipment by courier to the address notified during registration, withdrawal at the box office of the event in the day of the event or withdrawal personally or delegated specifically communicated and drawn up in Liveticket's offices (advised in advance). When requesting the delivery of the tickets by courier, they will be shipped within 3 working days from the date of purchase. In case of request of shipment by mail, Liveticket is not considered in any way responsible for any errors or delays in delivery, whose eligibility can be solely attributable to the post office themselves. In case of withdrawal at the box office of the event or at Liveticket, the customer must necessarily present himself provided with a copy of the email sent during the purchase, confirming the correct transaction occurred and bearing a unique order code. The failure to present this communication will make it impossible to collect the ticket purchased. 10. Limitation of responsibility and Liveticket's rights Liveticket is not responsible in any way for damage, direct and indirect, of any kind, caused to the customer in relation to the services offered. Liveticket also reserves the right to withdraw, modify, suspend or interrupt any function or service for technical or organizational reasons. 11. 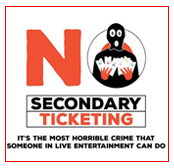 Prohibitions Tickets can not be used for political, commercial, advertising or other promotional reasons (such as, for example, prize competitions) unless prior written consent from the Organizer or Liveticket. 12. Organizer rules The sale is subject to the conditions specified by the organizer, when specified, available into the event section on www.liveticket.it site. The general conditions of this section must be intended integrated by those related to the specific event: acceptance of the conditions implies therefore also express acceptance of the conditions related to the event when posted on the event page; in case of incompatibility between general and special conditions, the latter shall prevail. 13. General 13.1 Even in case that any of the provisions in these general terms and conditions is unenforceable, the other will continue to have full effect. 13.2 Liveticket reserves the right, whenever it deems it appropriate, to amend and / or supplement these General Terms and Conditions. I agree with terms of sale.